Ops, looks like new recruits of the MRT ventured into the wrong ocean... the real monsters are coming from the Pacific instead! 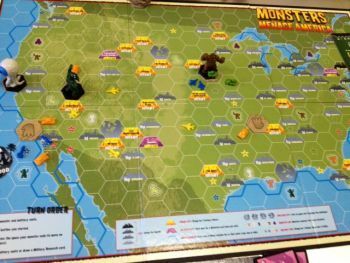 Check out monster / Kaiju sightings on this Crisis Map. When legions of monstrous creatures, known as Kaiju, started rising from the sea, a war began that would take millions of lives and consume humanity's resources for years on end. To combat the giant Kaiju, a special type of weapon was devised: massive robots, called Jaegers, which are controlled simultaneously by two pilots whose minds are locked in a neural bridge. But even the Jaegers are proving nearly defenceless in the face of the relentless Kaiju. On the verge of defeat, the forces defending mankind have no choice but to turn to two unlikely heroes - a washed up former pilot and an untested trainee - who are teamed to drive a legendary but seemingly obsolete Jaeger from the past. Together, they stand as mankind's last hope against the mounting apocalypse. Helmed by acclaimed director Guillermo del Toro (Blade 2, Hellboy, Pan's Labyrinth), Pacific Rim stars Charlie Hunnam as veteran Jaeger pilot Raleigh Becket teaming up with new recruit Mako Mori played by Rinko Kikuchi. 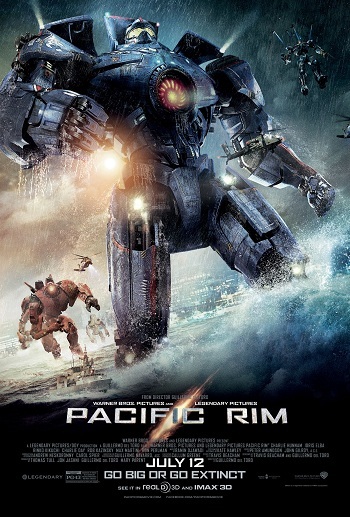 Leading the Pan Pacific Defense Corps (PPDC) is Stacker Pentecost portrayed by Idris Elba, whilst Ron Perlman is cast as Hannibal Chow, an opportunistic black marketeer of Kaiju organs. 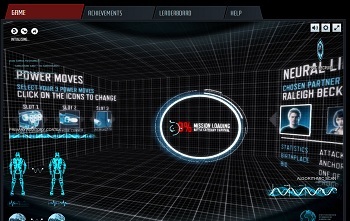 With award winning special effects from ILM, Pacific Rim is highly anticipated as THE Monster vs. Robot sci-fi movie of the era. The apocalypse begins in Malaysia cinemas nationwide on 11 July 2013. If you're caught in Kaiju attack, best study this PPDC Survival Guide. Check-out spoiler free reviews from CinemaOnline plus not-a-review by blogger eyeris. For more in-depth analysis, read-up badassdigest.com has to say. 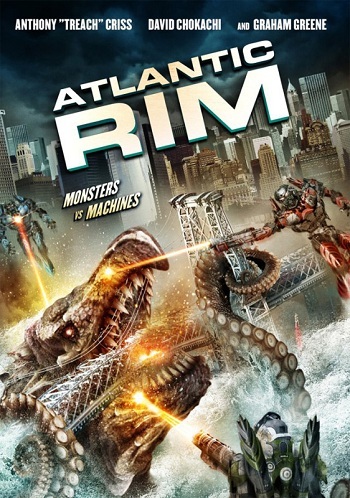 When watching this epic sci-fi movie, the Outpost MRT highly recommends to “Go Big or Go Extinct”, namely to catch Pacific Rim in IMAX 3D! 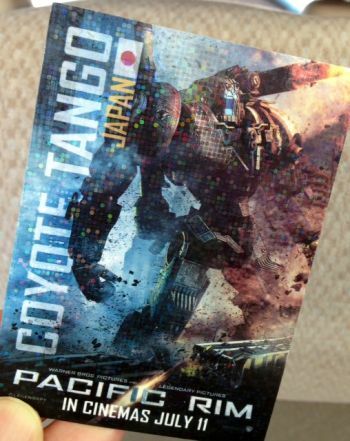 Watch this movie in TGV cinemas and also receive a Limited Edition Pacific Rim Trading Card. 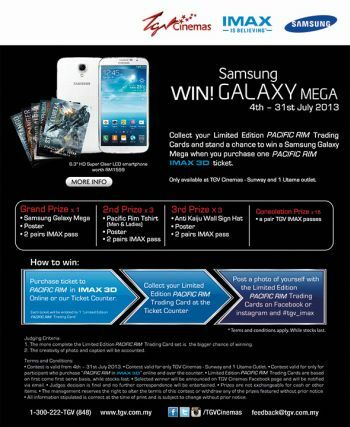 More chances to win the Samsung Galaxy MEGA smartphone from Warner Bros. Pictures Malaysia Facebook Page. 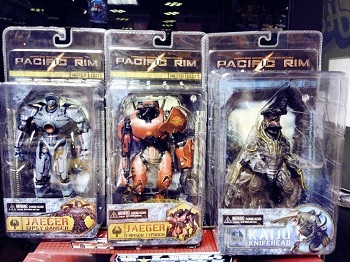 The hunt down the Kaiju, Outpost MRT designed our own customised hunter robots with the Jaeger Designer. 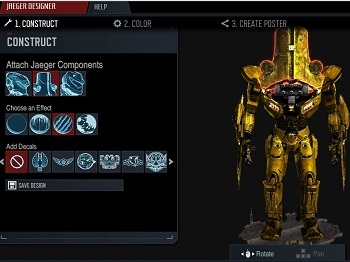 Upload your Jaeger design to the WB Jeager Digital Contest then share to your Facebook friends to Like to increase your chances to win. Artwork of your customised Jaeger in various dramatic action poses can also be downloaded to your desktop, phone and backgrounds. 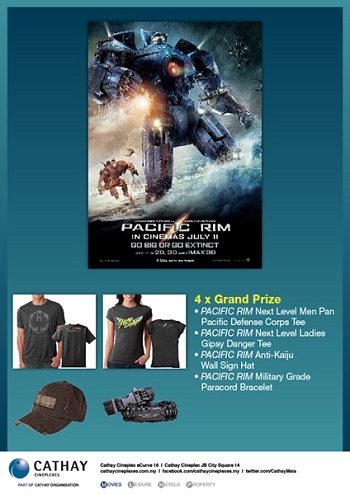 Stand a chance to win more official Pacific Rim goodies from Cathay Cineplexes Facebook Page contest with just a few clicks. 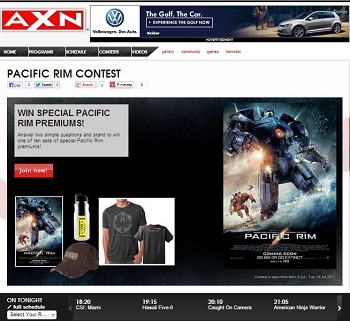 Increase your chances of scoring some of these Pacific Rim merchance by also joining AXN's online contest. 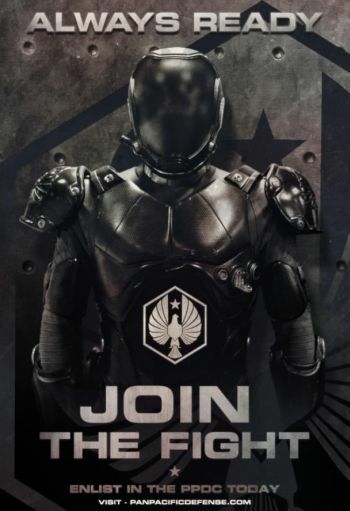 Doing our bit to save the world, the Outpost MRT signed up to join the PPDC at www.panpacificdefense.com. 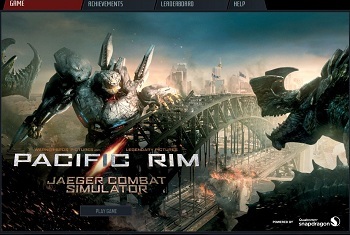 After receiving our duty assignments, we also experienced fighting Kaiju in the Jaeger Combat Simulator. The simulator may require some serious loading time but fortunately once activated it runs rather smoothly. Pilot your Jaeger with keyboard and mouse similar to 1st-person shooter games. The briefing room will probide some weapon choices that will equip your Jaeger with special attacks in battle with the Kaiju. Hint: press “ESC” to pause and show menu of function keys, i.e. navigate using “w” and “s” for moving front and back respectively while “a” and “d” is to sidestep left or right . Meet key members of the PPDC and find out more details of the Jaegers at the Shatterdome. 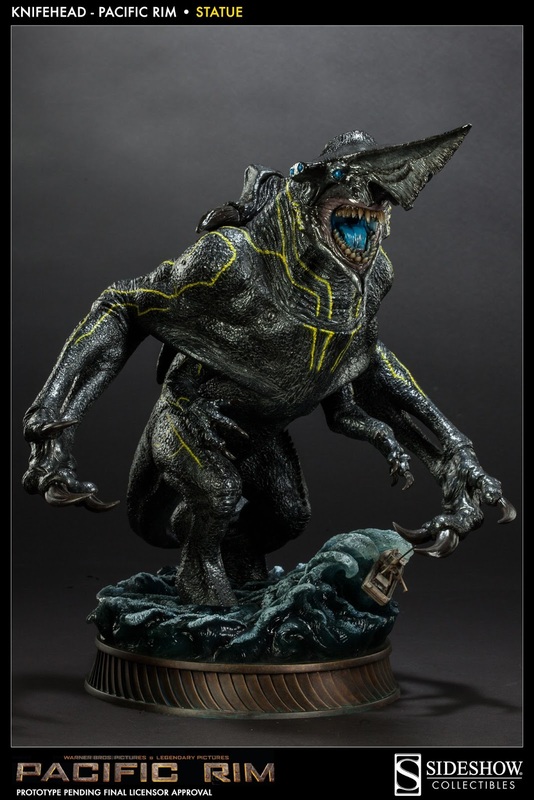 NECA's first set of 3 Pacific Rim 6-8in action figures include 2 Jaegers Gipsy Danger and Crimson Typhoon plus 1 Kaiju Knifehead. More detailed photos available at GNN GeekNews Network. 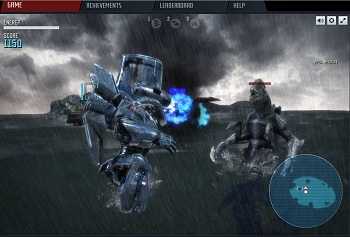 Although we don't find miniatures of Jaegers and Kaiju quite suited to the GIANT robots vs. monsters theme, the Heroclix Pacific Rim Figures does provide rather good 3-D visuals of these epic characters. 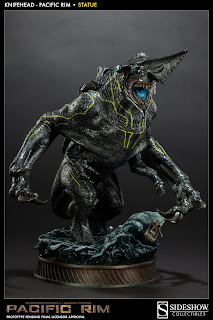 Collectors of premium limited edition memorabilia can pre-order statues of a series of Jaegers and Kaiju from Sideshow Collectibles, starting with Knifehead 17in tall model. However, it will be almost 1 year before the actual products are delivered. Oh, and if you trust Hannibal Chow, get harvested Kaiju organs to remedy a whole variety of ailments like cancer, insomnia, stroke, balding, erectile dysfunction, etc. We wouldn't wager our $$$ on Hannibal's company stocks though! Disclaimer: Pacific and its trademarks are copyright to Warner Bros. & their respective owners, referenced here for fan service announcements without intent to infringe.